The Jungle household is an ordinary two up, two down, two parent, two child-filled end of terrace. Days are occupied with school runs, fights over socks, at least three loads of laundry, superhero play, lots of stories and an equal amount of laughter and temper tantrums. Mainly from the children. Bedtimes are the traditional bath, book, snuggle up battles. After tucking my little boy into bed, followed by repeated requests for a drink, pillow fights, complaints that he is too hot, then too cold, it is on to question time. Leo at half eight starts asking where you go when you die, why cats have whiskers, how do people go to the toilet in space, and a plethora of other queries that my tired bran doesn’t have the answer to. The most popular phrase in our house is ‘shall we Google it?’ Much to my shame. The other evening after school I was helping Leo with his homework. Sheets of paper were scattered over the table and felt pens rainbowed across the floor. Giggling together he was calling me silly as I informed him that there were 9 planets in our solar system. Nope, apparently, I missed out Pluto being declassified. Space for my son is different than what it was for me. We both love looking up at the sky. He thought that the Milky Way was a chocolate, so we are even! Children are notorious for constantly changing their minds about what they want to be ‘when they grow up’. So far Leo has wanted to be a dinosaur, a police officer, a spaceman, an artist and Harry Potter. The high life of an astronaut. When Leo was going through his NASA phase, we discussed how spacecraft like the International Space Station have pressurised cabins and are filled with the same kind of air we breathe on Earth. We had fun holding our breath, closing our eyes and putting our fingers in our ears recreating the lack of air or sound in space! Comparatively, our home is rarely ever quiet. Microgravity causes astronauts to experience the effects of weightlessness. I am certainly not weightless. Sometimes our house seems like it is on another planet! A day in space is busy, and carefully planned by mission control (here mummy acts as Houston!) The ISS is like a large complicated house that needs constant attention and a lot of time is spent doing chores and repairs. Sounds familiar to me! Normal clothes are worn in the temperature and atmosphere-controlled enjoyment, but astronauts cannot do laundry, so they must bring a lot of pairs of socks! Whilst I only dream of having half an hour free at the gym astronauts need to spend at least two hours a day on exercise. Space foods come in plastic tubs and drinks need straws. Naturally, when the subject of space travel came up, we started thinking about what happens at bedtime in a space shuttle or space station and the big question of exactly how do astronauts sleep? After a long day working in orbit, sleeping is a little different in space. There is no up or down, and everything is weightless. Astronauts sleeping during space shuttle missions normally strap themselves into seats or attach sleeping bags to the walls to avoid floating away! They are usually scheduled for eight hours of sleep at the end of each mission day. We probably get about five hours if we are lucky so understand sleep problems! So how do you get a good night’s sleep, astronaut-style? The International Space Station orbits the Earth every 92 minutes, so the crewmembers see about 16 sunrises a day! They wear eyeshades or use pull-down shutters over the windows to keep out the sunlight while they are sleeping. Baby Norah needs a black out blind so perhaps she thinks she is an astronaut. FIVE, FOUR, THREE, TWO, ONE, TEMPUR®! Ground (and orbit) breaking creator of sleep and relaxation products TEMPUR® was first created by NASA in the 1970s to cushion astronauts during lift-off as they journeyed into space! After 167 years of ground-breaking innovation, after much research and development, TEMPUR® material is used to make mattresses and pillows certified by the Space Foundation, that ensure a comfortable night’s sleep. Who else can say that! Whilst no two people sleep the same, astronauts, parents or seven-year-old boys can all can struggle getting forty winks! Whilst strapping yourself down is unnecessary on Earth, investing in good quality sleep products that offers support, pressure relief and comfort is a good step (or one giant leap if we are sticking to space puns!) A little-known fact is that choosing the right pillow is equally important as choosing the right mattress. Leo has a habit of throwing his pillow over the side and putting his head to rest on his giant dog teddy. 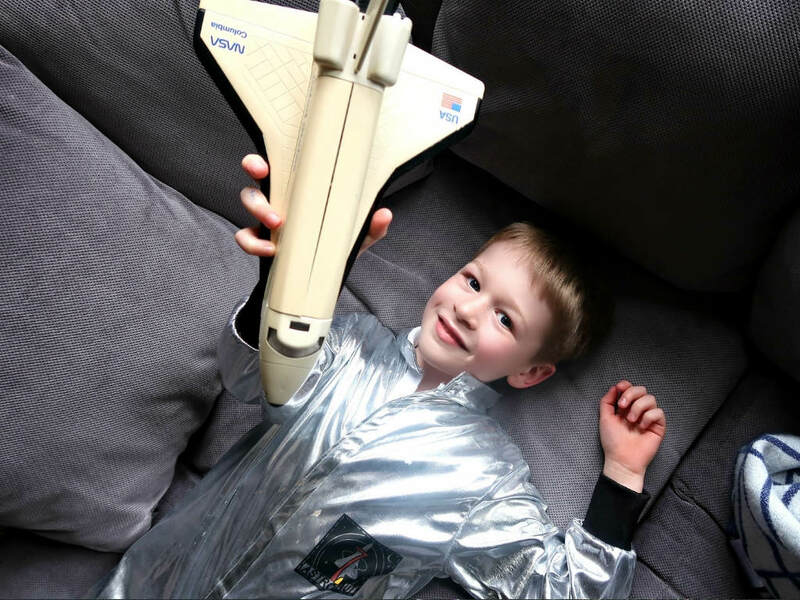 To improve the sleep of our little future astronaut we have picked the aptly named TEMPUR® Comfort Cloud pillow to try and decrease the night waking.